All WAN Optimization products are not created equal, especially as bandwidth requirements in data center-to-data center connections increase. Finding an effective solution in these environments requires more than simply comparing the features that vendors claim and assuming they’re accurate. * Can you scale TCP flows to at least 1Gbps speeds? * Does a 10Gbps NIC mean 10Gbps of throughput? 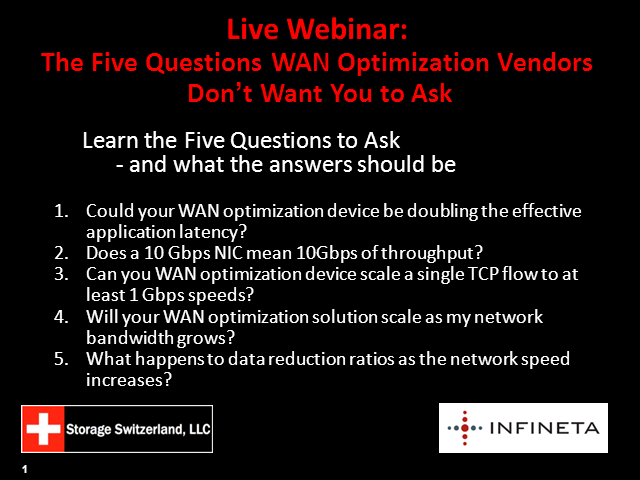 * Could your WAN optimization device be doubling the effective application latency? * Will your WAN optimization solution scale as my network bandwidth grows? * What happens to data reduction ratios as the network speed increases?